Experience the essence of Bolivia, from ancient times to the present. Learn about the ancient Tiwanaku culture & the Inca Empire as you visit archaeological sites throughout the country. Enjoy shopping the local markets filled with colorful, handmade garments & other unique handicrafts. Discover the influence of the colonial era as you visit the cities of La Paz & Sucre. This ten day tour is a great opportunity to gain an appreciation for Bolivian culture, & see many of the nation’s famed sites. Lake Titicaca – Sail South America’s largest lake. Visit Sun Island & Moon Island. Mining Tour – Head down into one of the mines of Cerro Rico Mountain to see where the Bolivian miners excavated silver. 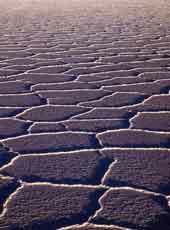 Uyuni Salt Lake – Largest on the planet. The area is home to flamingos, giant cacti, & other wildlife. 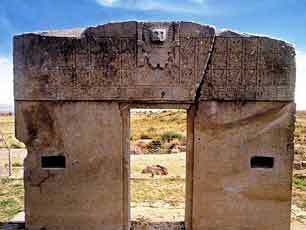 Ancient Tiwanaku Civilization – UNESCO World Heritage Site. Features ruins dating back to over 1000 years ago. Arrive at the airport, & transfer to the hotel. Enjoy the remainder of the day at leisure. Discover fascinating ruins of the ancient Tiwanaku civilization. Highlights include the Gate of the Sun & the Kalasasaya. Afterward, return to La Paz. 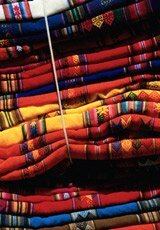 Enjoy shopping for handmade crafts, clothing, & other unique items at one of the city’s local markets. Take a walk through Murillo Square, visit the 18th-century Cathedral of San Francisco, see more artifacts from the Tiwanaku civilization at the Gold Museum, & admire the colonial buildings along Jaen Street. Enjoy dinner & an overnight stay in La Paz. Head to the dock in Copacabana this morning. Sail along Lake Titicaca, heading for Sun Island. Enjoy exploring this fascinating & historic island, which features an array of wildlife & ruins from the Inca Empire. Before leaving Sun Island, enjoy a guided tour of the Chincana archaeological site. Highlights of the ruins include a stone labyrinth. Return to the waters of Lake Titicaca, & head for the Island of the Moon. This small excursion takes you to see the ruins situated on the island. Afterward, it’s back to the boat & off to Copacabana. There will be time for sightseeing or shopping before transferring back to La Paz. Travel to the city famed for its carnival, Oruro. Visit the National Anthropology Museum, or enjoy time to explore the city at leisure. 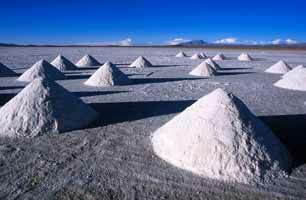 Next, transfer to Uyuni for dinner & an overnight stay. Spend the day visiting one of Bolivia’s most spectacular, natural formations, the Uyuni Salt Lake. The salt lake is known for being the largest on the planet, & it features a unique array of plants & wildlife, including flamingos & giant cacti. Travel to Potosi today, & learn about the city’s history of silver mining. After your guided tour, enjoy the remainder of the day at leisure. Head to the nearby Cerro Rico Mountain for a mining tour. Next, transfer to Sucre for dinner & an overnight stay. Experience the charms of Sucre on your last full day in Bolivia. Sightseeing highlights include the Cathedral of Sucre, the Basilica of San Francisco, & the House of Freedom. Later today, transfer to the airport, & board flight to La Paz. In the morning, transfer to the airport, & board return flight home.